After popular demand i’ve decided to put together a quick update on the Fraser Valley real estate market. For the most part it’s doing similar things as the rest of the Greater Vancouver market. The trend appears to be detached sales and prices slumping, while condos continue their torrid pace. Let’s break it down. Fraser Valley detached sales were down 47% year over year in January. To add to that, detached sales were also 15% below the 10 year average. The detached in the Valley lagged behind Greater Vancouver on the way up and appears to be doing the same on the way down. While sales fall, inventory is also rising, up 16% year over year. The median and average sales price shows a 7% price correction since it’s peak in May. The MLS benchmark shows a 4% drop. MLS Benchmark price for Fraser Valley detached. The townhouse market is still going quite strong. The sales/actives ratio of 39% (way down from it’s ridiculous high of 105%) indicates it’s a sellers market. With that being said, townhouse sales are down 22% year over year, but still 27% above the 10 year average. Inventory is down 29% year over year, so unless sales continue to fall drastically a surge of inventory will be needed to push prices down. Townhouse prices in the Fraser Valley appeared to have had a cool down phase during the Fall and winter months. It appears to have had a recent resurgence as the average sales price sits at a record high in January, up 24% year over year. The Median sales price is flat. Meanwhile, the MLS benchmark also confirms prices had a cool off phase. Here’s where things get really interesting. The condo market is still off the charts in the Fraser Valley. Likely due to the fact it remains the most affordable option amongst locals. 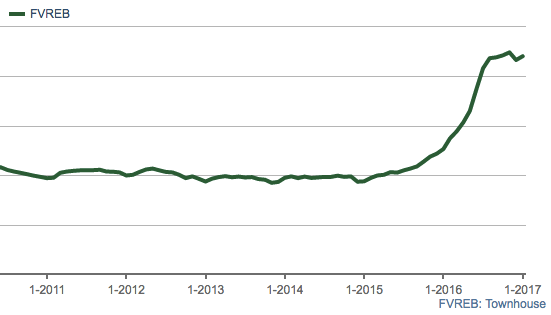 Fraser Valley condo sales are up 42% year over year, and 80% above the 10 year average! 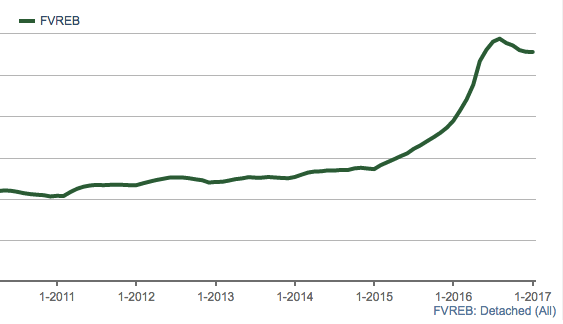 Important to note that Fraser Valley condos really didn’t take off until February 2016, well behind any other segment in the lower mainland. 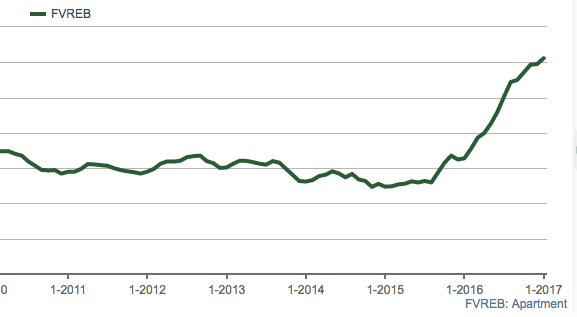 With inventory levels falling 29% and demand at unprecedented levels it’s likely prices continue to climb. It appears Fraser Valley condos are going through their FOMO phase as 37% of condos have sold over asking price in February thus far. The average, median and benchmark are still setting record highs. The average sales price is up 24% year over year, median 21%, and MLS benchmark shows a 28% jump. MLS Benchmark price for Fraser Valley condos. To summarize, the Fraser Valley essentially lags behind the rest of Greater Vancouver. It’s something I noted on the way up and will likely play out on the way down. With that being said, the condo and townhouse markets remain red hot and I don’t expect that to change anytime soon, despite the detached stumbling.